Running numbers 4000 to 4062. 1922 (4061 - 4062) to lot number 217. The prototype four cylinder 'Star' locomotive was built in May 1906 with experience learned from the 'Saint' class and the French De Glehn engines. By incorporating the De Glehn cylinder arrangement with two sets of valve gear into an otherwise standard design, G. J. Churchward produced a masterpiece which harmonised the best features of the different engines on trial. 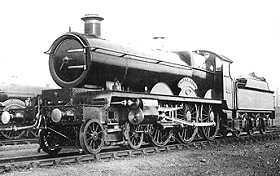 Given number 40, she was built in 4-4-2 configuration as Churchward had not decided which was the best wheel arrangement for the Great Western. With cylinders of 14¼ x 26 inches and an unusual scissors valve gear (Walschaert's valve gear was fitted as standard on all other 'Star' locomotives), she ran unnamed until October 1906 when she became known as 'North Star'. Number 40 was rebuilt in configuration 4-6-0 in November 1909 and was also given the curved framing that was built on the second batch of production engines. In December 1912, 'North Star' was renumbered as 4000. One difference in North Star compared to the rest of the 'Star' class was that the footplate was built 2½ inches higher and even when this engine was rebuilt in a 'Castle' class locomotive, the footplate kept the non-standard height. Number 4011 Knight of the Garter was fitted with the Swindon no. 1 superheater as standard together with the French type of bogie. All members of the class were so fitted with this bogie. The Swindon no. 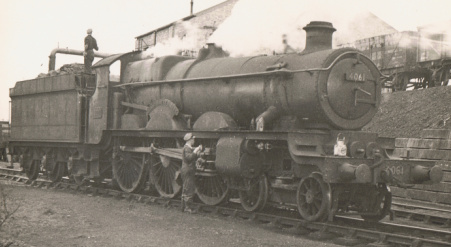 3 superheater was initially fitted to number 4021 King Edward and became standard fitting from engine number 4031 Queen Mary, again, previous locomotives of the class were modified from 1913. The modification which gave the 'Stars' a little more power was an increase in the cylinder bore to 15 inches. This modification was applied first to number 4041 Prince of Wales and soon afterwards the cylinders of earlier locomotives were also increased in size. 4000/1/8/10/13/17/18/21/22/24/28/35/38/44/47/51/54/55/57/60/61-72 were fitted with cast iron chimneys for the period 1919 to 1924 as an austerity measure, the latter 12 engines had them fitted as standard. 4000 North Star and 4003 Lode Star were fitted with the new audible signalling equipment in 1908 in connection with the first installation of Automatic Train Control between Slough and Reading. From 1920 to 1923, number 4060 Princess Eugenie carried a boiler with an experimental smokebox with the chimney moved forward and an altered blastpipe. Afterwards, this arrangement was transferred to number 4043 Prince Henry in 1925 and number 4004 Morning Star in 1927 but as no appreciable advantage was found, the idea was discontinued. In common with all locomotives on the Great Western, all bogie brakes were removed from November 1923, as they found not to be worth the extra complication. Between 1925 and 1929, numbers 4000/9/16/32/37 were taken out of stock and rebuilt as 'Castle' class locomotives. Similarly, numbers 4063 to 4072, known as the 'Abbeys', were rebuilt as 'Castle' class engines between 1937 and 1940. Outside steam pipes were fitted to most of the class from 1929 although of two types, 'Elbow' and 'Castle'. The 'Elbow' type doubled back between the frames and was used when new inside cylinders or saddles were fitted with the old pattern outside cylinders. The 'Castle' type of steam pipe was used when new pattern outside cylinders were fitted. From 1932, the upper lamp irons were transferred from the front of the chimney to the smokebox door while from 1939, some members of the class received the Grange type of shorter chimney, 1 foot 9 inches high compared to the previous 1 foot 11¾ inches. Only one example of the 'Star' class is preserved, number 4003 Lode Star at the National Railway Museum, York.